What exactly is love in business and how do you make it happen? When people love the business, there is unity with people connected by a common purpose. When people love working together, there is appreciation with people nurtured by a positive culture. When people love what they do, there is accountability with people delivering a powerful creative performance. The source element for all of this is each individual’s powerful positive connection with their true self, which releases their own innate wisdom. When people truly connect with themselves, they come from love and effortless flow from which all else becomes possible. When there is love in a business it’s a game-changer for an organisation and it gives any business a competitive advantage. I know that around the board table, talking about ‘love’ might, at the very least, raise a few eyebrows. A more familiar concept for any board is ambition. Big ambitions are one of the defining characteristics of a vibrant, successful organisation. And I know for sure that the simple key to delivering great performance, from nation to nation, sector to sector, from the top team, to the shop floor is this: Big ambitions require Big Relationships. Be the ‘first’ within your industry. Innovate and be a leader of new ways of thinking, being, doing what you do. Be cutting edge. Make a difference in the world. Work better together, improve relationships, have happier people. Get better results: efficiency, productivity, profit; increase in any key business measure. Attract highly talented people, improve retention, live and breathe your brand. Have a much-needed breakthrough as you are in free-fall, unsure how to re-focus, re-structure and re-build. If you’ve been a leader, or worked in Human Resources (HR), or been responsible for driving through any kind of change, you know that getting groups of talented individuals to work harmoniously is difficult. Enabling them to be happy for any length of time can be painful, frustrating — even unrewarding. Frankly, it soaks up energy and resources you could be using elsewhere. Organisations can look like rational places; in fact many might claim to be entirely rational domains. Yet organisations are just bunches of people, and the reality is that the emotional domain, although sometimes less acknowledged, is just as — if not more — significant and important. Believe it or not, we humans make decisions based on emotions not logic. When people are not aligned with each other and with your goals, the waste is huge. Jaded listeners don’t hear properly; fragmented teams spend time and effort self-justifying, second-guessing, and mistrusting. A lack of cohesion, a lack of acknowledgement, a lack of confidence creates impotency that can impact business success. Even when we do acknowledge the emotional, when we do invest in new people-development systems, new processes, new rewards; even then, the problem is that, in business, things get in the way: the bottom line, politics, self-interest, stress, market pressures... life. The reason for this is because most organisations operate as ‘outside in’ systems. By that I mean they try and fix things in the business by creating new structures, new processes, new systems, new interventions. They believe that if they create enough carrots, enough sticks, then things will work better. Although this may have some impact initially, it usually doesn’t really stick. Yet there is a way to transcend all of this. And the solutions actually lie inside your people — through unlocking their powerful positive connection to the business, each other, what they do and most of all to themselves. 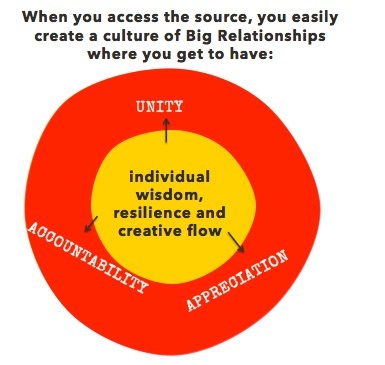 By creating Big Relationships that deliver unity, appreciation and accountability all sourced by individual wisdom, a business can not only survive, but thrive. …In your business, people really loved the business with a passion, were unified and connected to a common purpose, shared a clear compelling ambition and operated from a strongly held set of shared values? …You all believed in something bigger than profit? …Your purpose inspired each person from the top to the bottom of the organisation because it was also about people and the planet? Each person knew what part they played in making it happen. Everyone saying, feeling and acting ‘united we stand’? …You had a culture filled with appreciation, with teams celebrating each others’ success and operating from empathy rather than judgment? What if people positively appreciated and focused on what is good and who does what well, with roles structured so that everyone can play to their strengths — confident, collaborative teams built on trust saying ‘we not me’? …Your people as individuals were powerfully accountable, totally clear about what was expected of them, oozing ideas, creative confidence and innovation, standing tall and achieving mastery? What if your people were whole-hearted and proactive, taking things on, and empowered to set and achieve their own goals — getting out of bed to come to work with a smile because they love what they do and saying ‘you can count on me’? …You’d found a way to unlock the source of unity, appreciation and accountability: every person’s own innate wisdom? What if people were able to operate with resilience and optimism, having hope and faith in themselves, the people around them and the business? What if your people accessed their own calm, clear state of mind as the source of well-being and effortless flow — coming from love; feeling good about themselves and performing at their best? If you had all that, you’d truly have big relationships and you’d have your customers and stakeholders feeling the love too. And then there would be more of them, all of that giving you a damn-good shot at achieving your big ambitions. Now that’s why love belongs in business. 1. Evaluate – where are you now? How much are your people operating from their own wisdom, resilience and flow? How unified are you by common purpose, shared ambition and values? How appreciative and collaborative is your culture? How accountable and creatively autonomous are your people? How are you as a leader modelling the way on all of these? Focus on your top priority first. Encourage optimism and hope, staying open to possibility and seeing the best in what is. Encourage each person to create their own flow and trust themselves, which makes all else possible and is the fastest route to liberating organisational potential. Identify ways you can cultivate a culture of trust and appreciation. How can you appreciate more and criticise less? Are people crystal clear on what initiatives they are the source of and which ones they are a helper on? How are you actively fostering a culture where it is ok to take risks and create? How do you encourage individual mastery – a key motivator in accountability? Identify, train and empower your own in-house tribe of Big Relationship Facilitators to seed, sustain and grow unity, appreciation, accountability and wisdom across your organisation. How do you ‘make learning awesome’ in everything you do? The question this poses is not whether or not love belongs in business: we hold this truth to be self-evident. The question is: how on earth do you practically achieve it in your organisation? How can you actually do it and build Big Relationships and powerful positive connections to increase happiness, creativity and productivity — and the bottom line? And can you make it stick? If you’re responsible for the performance of teams or individuals, there will be things that you’ve done or are doing that are working. Reflect on that and gain confidence that you can follow your instincts and do this. Go you! Yet while we might see these pockets of success, few organisations know how to integrate all the seemingly contradictory needs of individual people with a business that’s required to make money. One of my clients, CookFood – a UK Food manufacturer and retailer are however, a case in point. Founder Ed Perry has always believed in doing business the right way. He believes a business has responsibility for it’s impact on people, the community and to operate in a sustainable way. As a result, Cookfood led the way in becoming the first large B-Corp in the UK. Cooks’ core purpose is to COOK For Good, creating a remarkable food business that’s a force for good in society. Cook’s values are: Be part of our family, Churchill’s pig (we’re all equal), Be Remarkable, Care, Have Fun. At Cook, they put money and time behind focusing on being a purpose and people driven business and are innovators in the space of reinventing business. People love working at Cook as they believe in Cook’s purpose and because Cook takes care of them by ensuring a culture of appreciative relationships. “This is a company that knows its staff are human beings who occasionally have a bad day. An honest approach, says COOK, which retails frozen meals, is one of the keys to building a happy workplace. The firm has set out to build an “appreciative culture” where relationships can flourish and people feel connected to each other. Forty senior leaders underwent a Big Relationships training course, and spread its key tenets through the company. First, COOK encourages employees to put themselves in their colleagues’ position, in order to build empathy and compassion. Second, it champions understanding and celebrating differences, and finally it “cheerleads” its people, appreciating their contributions. Won the Sunday Times Wellbeing award in 2015 for our work on Relationships and Values, and a Special award for Discovering Potential in 2016 for employing prisoners and positive recruitment policies. Have an extremely low full-time people attrition rate and spend very little on recruitment as people are attracted by reputation. At Cook having a job means more than turning up for a pay cheque. It means being part of a work family who care and who believe in something worthwhile. Human beings look for meaning in what they do. At work and in society. Many people no longer want to work for businesses that are just about money: they want to work for businesses that are contributing in some way to the well-being of people and of the planet. They want to work for businesses that, while needing to make money, also exist to make a positive impact on communities, on society and on the environment. Those are lofty reasons for being. There’s a lot of altruism in there. But at the same time, creating a compelling purpose is equally about delivering an excellent performance. Big relationships are about making people feel good – about themselves and giving them something to believe in that helps them feel connected, to each other and to their inner sense of purpose. Something to love. When people feel connected, they think and feel better. And when people feel better, they do better. And lead better. And leaders lead organisations. And organisations for good can change the world. I’ve seen what’s possible and I know love in a business can be achieved with great leadership and a fair wind. And by the way, that great leader might just be you. Elizabeth Lovius is a Leadership Coach with over 20 years experience. Elizabeth helps leaders access creative flow, have big relationships and lead change for good.